This best-selling argument book teaches students to listen rhetorically and argue effectively. A streamlined argument guide plus provocative thematic reader, Everything’s an Argument with Readings helps students understand and analyze the arguments around them as well as create their own. Lucid explanations cover the classical rhetoric of the ancient Greeks through the multimodal rhetoric of today, with professional and student models of every type. New attention to rhetorical listening skills teaches students to communicate effectively and ethically as they work through potentially contentious discussions in and outside the classroom. Thoroughly updated with fresh new selections in both the guide and the reader, this edition of Everything’s an Argument captures the issues and images that matter to students today. 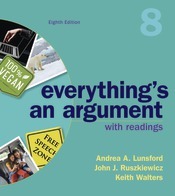 LaunchPad for Everything’s an Argument provides unique, book-specific materials for your course, such as brief quizzes to test students’ comprehension of chapter content and of each reading selection. LearningCurve--adaptive, game-like practice--helps students master important argument concepts, including fallacies, claims, and evidence. Also available in a brief version without the reader.